I’ll say this much, the thing feels absolutely fantastic. The enclosure is thick and substantial, and the buttons have a very satisfying response. It even has a nice heft to it with the 9 V battery installed. Aesthetically it reminds me of a ladies shaver from the 1980’s, but if the goal was to make it look non-threatening and vaguely medical, I suppose they hit the target. The red LED diffuser at the top is particularly nice, though I was somewhat disappointed to find the device didn’t make any frantic beeping sounds when triggered. Overall, it reminds me of the Scientology “E-Meter” we saw taken apart last year. These devices are designed to impress the user, to make them think they’re operating a high-tech instrument. It’s all part of the experience, and I would love to know what the original retail price would have been for this particular gadget. Of course, beauty is only skin deep. The real question is, does it work? To that end, I have to say the performance is about what I expected. I was only able to get it to fire off twice: when sitting on top of the microwave, and when a few inches away from a fan. As theorized, this gadget only indicates the presence of a relatively high levels of electromagnetic radiation. To that end, one could say that the concept is not entirely unlike the old Civil Defense survey meters. The sensitivity was so low on those meters that any motion of the needle effectively meant the area was unsafe for human occupancy. The idea was that in the event of a nuclear weapon being detonated, all the user really needed was a way to see if it was safe to come out of their shelter. 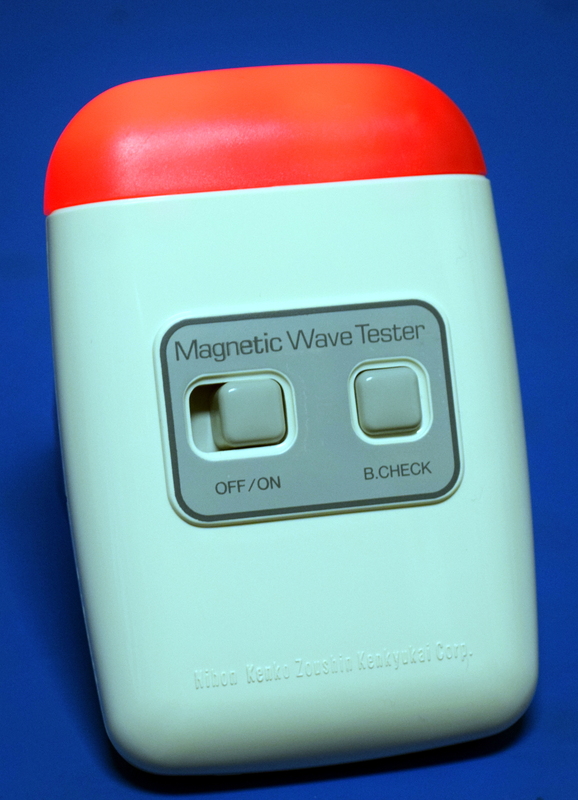 In the same way, the “Magnetic Wave Tester” seems to only respond to EMF that’s high enough to be a concern. In other words, if you saw this thing lighting up when you waved it over your bed, you should probably stay at a hotel. So it looks nice and even lights up if you try to put it in the microwave, but what we really want to see is how it works. With the battery door removed, there’s just a single screw that stands between us and the wonders within. Just to get it right out of the way, yes, that is a reed switch on the back of the PCB. Further, placing a magnet behind the meter does cause it to light up. That being said, the reed switch is clearly not the primary sensor in this device and must exist as some secondary function. Honestly, the only thing I can think of is that they wanted to make sure that any user who “tested” the device by holding it up to a magnet wouldn’t be disappointed that it didn’t go off. Not that the primary functionality is much more advanced. From a cursory look at the board, it appeared that the coil in the center was being used as a sensor. A nearby magnetic field would induce a slight voltage in the coil, and once it hits a certain threshold the LEDs come on and alert the user. Testing the theory is simple enough: with the oscilloscope put across the coil and the volts per division turned down low, a sine wave was observed when the device was moved close to an AC fan in operation. It’s not a terribly accurate method of measuring an electromagnetic field, but of course that was never the goal. If all you want your gadget to do is light up when something nearby is pumping out a decent amount of electromagnetic energy, this is a cheap and easy way of doing it. Many of the people reading this teardown probably guessed early on that the internals of the “Magnetic Wave Tester” would leave something to be desired. With the operator presumably uninterested in nuances such as field intensity, there’s no advantage to making a device capable of quantifying what it’s detecting. A magnetic field detector which returns a Boolean response must rank up there with divining rods and gemstones in terms of scientific application. Still, if we don’t test these assumptions and simply take our preconceived notions as truth, we’d be in the same boat as the folks for which this gadget was designed. We can now rest easy with the knowledge that our theories were validated, which is perhaps more than could be said for anyone who hoped this blinking toy would allow them to contact the spirit realm. Is it maybe just an enigmatically named microwave oven leakage detector? Hmm to be a 2,4 GHz leakage alert it should have an antenna tuned – like this simple field strength meter http://9w2xan.blogspot.com/2010/11/simple-field-strength-meter.html – There are some professionally made ones. Basically you need an antenna, a diode demodulator and a meter. I think that if you have a suitable antenna a cheap satellite finder should do spmething and beep. I have the real world version of this somewhere in my junk box – it has a 3-1/2 digit LCD display, and an analog output hall effect sensor in it – it reacts nicely to the deflection coils of a CRT monitor and even a nearby magnet, and beeps when the level goes above a threshold. I wonder if it would go off if you weren’t close enough to a nuclear explosion to be vaporized but wanted to know if the explosion was nuclear in origin or conventional? Conventional explosives also produce EMP. Sounds like something the church of scientology would sell it’s members for a load of cash. I would venture a guess that this device was built to help people who have a pacemaker to detect static fields via Reed switch or RF fields via the coil which are strong enough to disrupt their pacemaker. Yes, I’d say the reed switch is there to satisfy the prospective buyer who doesn’t know the difference between EM waves and magnetic fields and tests the gadget with a magnet. Maybe the sales rep will have one handy. I’d guess it’s a quack medical device. Japan has a LOT of that sort of thing. Even if it is a fake medical device, chances are the people who made it simply re-packaged a tool already sold in hardware stores. If it reacts to induced magnetic fields, you can put it next to a power cable or wall socket to see if it’s live. It’s basically a wire finder. That’s very useful. You should check if there’s a magnet in there that is placed close to the reed switch, because a nearby iron object would attract the field and cause the switch to actuate. That would make it useful for locating nails in the walls, which tells you where the supporting beams are. Again, very useful. I could do better with capacitance coupling to an audio amplifier. The problem with using a magnetic field is that it would require an actual working load at the end of the line, and that working load would have to be large enough to trigger the magnetic field detector. Conversely, a capacitatively coupled amplifier would work regardless of load. Maybe that was the point.. In order to detect where a particular wire went, you could attach a light bulb at the end and recognize the cable from a bunch of others by the fact that it was passing current, then follow it along different conduits.That’d make it more useful than the typical electrician’s pen that simply responds to an alternating voltage being present. In a classical Feynman situation, you’d take a lightbulb and a blinker relay, and find the wire that makes your device blink even if there were multiple ones carrying current. I had the same thought, but was unable to get it to react to any live wires. Even with a decently sized load running on the line, it never lit up. I even tried following the power cord for the things that do wake it up (microwave, big fan) with no results. But in any event, I agree that this device was more likely co-opted by the paranormal folks versus being designed for that purpose. The thing I find odd though is that they would use something which such a high activation threshold. I’ve actually played around with some EMF detectors designed for paranormal investigations (like the K-II), and they are extremely sensitive, flashing at even the slightest perturbation of the local magnetic field. Then again, if you’re in an abandoned house and this thing starts lighting up, it’s probably time to get the Proton Packs out of the car. Well, the company sells magnetic healing shoes and other gadgets that claim to use magnetic fields for healing. Maybe the point wasn’t to intimidate the public, but to promote their products. In that use, it would make sense to include both inductive sensors and a reed switch. The reeds switch is there to be activated by a magnet containing ring worn by a magician or paranormal investigator. I was thinking live-wire-detector, but it looks like Tom ruled that out. That it comes from a “paranormal” shop is more evidence. You just put the last piece in the puzzle. Case closed! Worthless! They didn’t sell actual pyramids. Magnetic crystal pyramids with copper headbands are the only sure thing! Found the company. It’s named 株式会社日本健康増進研究会 in Japanese, meaning “Japan Health Promotion Research Group Corporation”. Promote health you say? According to this “What to do when you someone invites you into a pyramid scheme” website, https://mlmhyoubann.seesaa.net/article/432909803.html , this company is quote-unquote definitely not a pyramid scheme because it isn’t and it’s a solid and lucrative and safe network business. Aha. I see, a “risk-free network business”. so… the other P scheme, I guess…? It’s obviously a UFO detector like this one but not as fancy. No Free Same-Day delivery? I don’t even know why I pay for Amazon Prime at this point. Maybe it’s one of those “dirty electricity” detectors. Finds those autism-causing magnetic radiation rays. Kind of old construction, though. Maybe they’ve moved on to making “200 mile range digital HDTV antennas” that sell for $3.98. Yah, the clear LEDs probably mean this one was made in 90s, but board design looks late 70s. A hotel in Cuba perhaps? “people who believe strong magnetic fields have some homeopathic properties” – this is weird on many levels: ‘homeopathic properties’, to me, translates to ‘no properties aside from marketing’ but the sentence does not make sense that way. To some people, ‘homeopathic properties’ means ‘health-influential properties that intensify with dilution-by-leather-damped-banging’ – also not a fit for the use in this sentence. Are there indeed people who ascribe ‘homeopathic’ health effects to *strong* magnetic fields (homeopathy meaning like-with-like, i.e. cure some ailment by application of an agent that, in another (usually: many many orders of magnitude higher) dosage would cause symptoms somehow thought to be related to the ailment) ? tool from the panawave laboratory cult? A rebadged microwave oven leakage detector from a religious cult? Perhaps the First Church of Appliantology! (Frank Zappa’s dig at Scientology).